Fans of YouTube powerhouse PewDiePie and Twitch star Ninja have a whole new reason to be cheerful this holiday season. 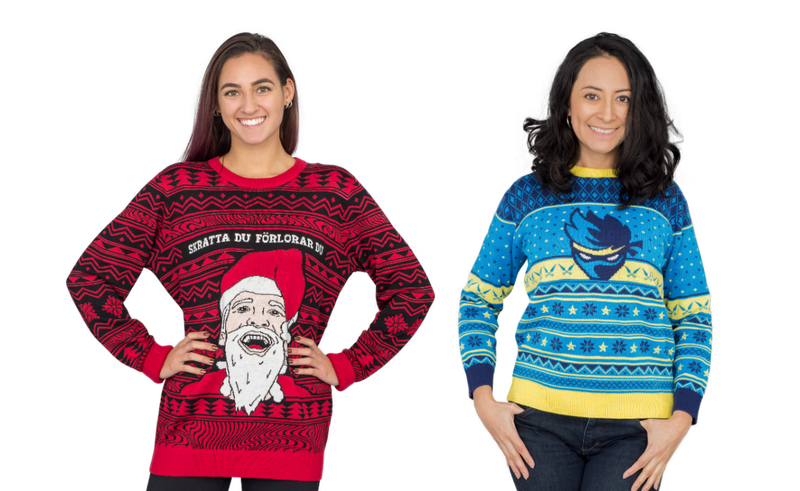 Both creators are releasing merch lines with UglyChristmasSweater.com, a Michigan-based brand that, of course, supplies leagues of ugly Christmas sweaters — with themes ranging from baby Jesus selfies to Bob’s Burgers. PewDiePie’s (real name Felix Kjellberg) line is already available on the company’s website, and Ninja’s (Tyler Blevins) will drop on Dec. 5. PewDiePie’s collection includes hats, socks, and lounge pants all bearing the pattern from his signature red-and-black logo. But the centerpieces are a onesie with a hood shaped like PewDiePie’s face wearing a Santa beard hat, and the ugly sweater itself, which features a printed version of PewDiePie Santa. Both the onesie and the sweater are printed with the phrase “skratta du förlorar du,” a Swedish phrase that means “you laugh, you lose.” PewDiePie has long used it as the intro phrase for his popular YouTube series of the same name. Ninja’s collection includes socks, scarves, a onesie — and not one, but three ugly sweaters. PewDiePie has said items from his collection will ship in time for fans to have them by Christmas, and he gave followers a good long look at the onesie in a recent video (below). You can see his full line here, and Ninja’s full line here beginning Dec. 5. Ninja’s Spent 3,800 Hours Streaming ‘Fortnite’ This Year. That’s The Equivalent Of 95 40-Hour Workweeks.